DAREN WANG is the Executive Director of the Atlanta Journal-Constitution Decatur Book Festival, the largest independent book festival in the country. Before launching the festival, he had a twenty-year career in public radio, both national and local, with a particular focus on books and authors. Wang has written for the Atlanta Journal-Constitution, Paste magazine, and Five Points magazine, among others. The Hidden Light of Northern Fires is his first novel. “In this fine novel, Daren Wang compellingly depicts the darkness of our country's greatest era of strife, but he also finds courage and love. The Hidden Light of Northern Fires is a wise and timely book." "The Hidden Light of Northern Fires is so self-assured I’m shocked it’s a debut. Wang’s absorbing and ambitious first novel brings our history to vivid life in scenes that are by turns brutal and breathtakingly lovely. I will carry this story of love and vengeance, ruin and restoration with me for a long, long time. Read it--you will want to pass it on." "Mary Willis makes Scarlett O’Hara look like a whiney brat. 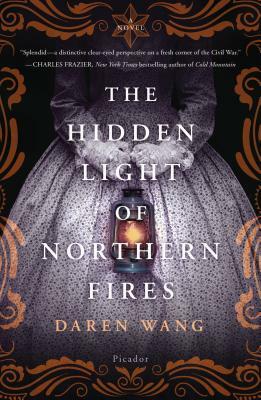 Sure, The Hidden Light of Northern Fires brings to life an astounding lost story of the Civil War, but is also a stay-up-all-night, read-it-in-one-sitting novel that looses the corseted ladies of the era onto the real world." "In Daren Wang’s capable hands, the bloody history of America’s civil war unfolds on the Union side of the Mason-Dixon line, where it turns out to be as heartbreaking and horrifying as it was everywhere else. In Town Line, NY, a hamlet that voted to secede from the Union and declare itself an independent state, the conflict is rendered in microcosm as siblings and friends take up arms against each other. The little-known history that informs The Hidden Light of Northern Fires is nearly as interesting as the vividly portrayed characters who struggle to find the right course of action or to redeem themselves from terrible mistakes. Wang’s engaging novel is a timely reminder of what can happen to a people when human rights are denied and the civil fabric of a nation is torn to pieces." "A moving tale of loyalty and betrayal, violence and retribution, lofty ideals and harsh reality. Daren Wang has shined a light on a hidden corner of a story you thought you knew, revealing a divided America that, like our own, is both strange and true."